With creamy vanilla custard and ripe pears, this Pear Vanilla Custard Pie is worth every bite. 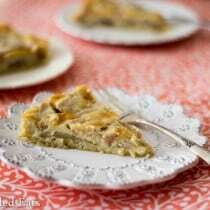 One of my girlfriends from college, Kris, is famous for her Pear Vanilla Custard Pie. She has made it many times for our girls’ nights and has passed out the recipe among our group. I’ve made it 4 or 5 times over the last few years but it was not gluten or sugar-free. When I had a few very ripe pears in the fruit basket that I needed to use I decided it was time to adapt her recipe. 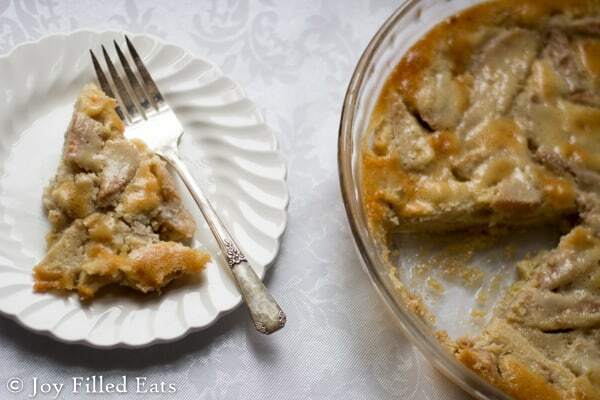 I kept this pie crustless but it is delicious with a crust as well. I’ve made it both ways. If you want to use a crust here is the recipe I use a lot. It is a press in crust. Just press it in the pan, poke it with a fork, and bake as directed in the Pecan Pie Tart recipe. 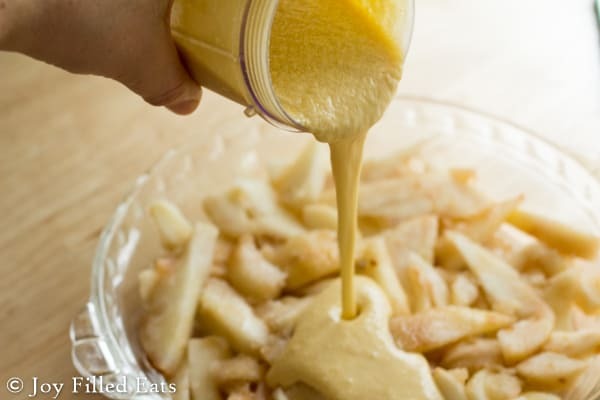 Then add the pears and custard and bake again using the instructions for this recipe. Without a crust it is as easy as peeling and sliced the pears, mixing the ingredients in a blender and pouring them over the pears. It takes about 10 minutes to prep. Even with the pears, this is still only 9 net carbs per serving. For my Trim Healthy Mama friends, this would be an S Helper since it has a non-S fruit. I think it’s worth the splurge of a few extra carbs. 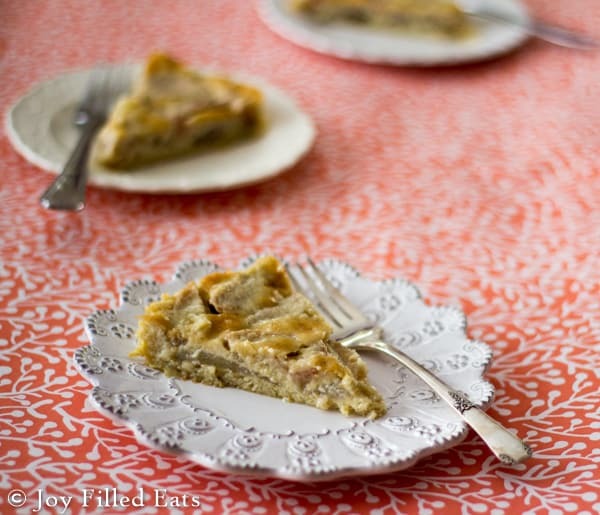 With creamy vanilla custard over ripe pears, this Pear Custard Pie is worth every bite. 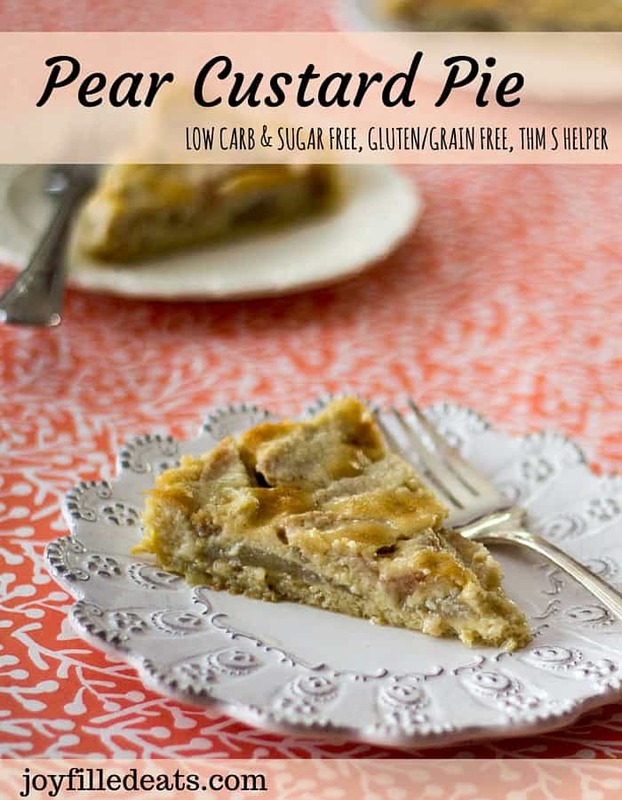 Low carb (9 net per slice), sugar-free, grain-free, gluten-free, THM S Helper. Grease a pie plate. Put the peeled and sliced pears in the bottom. Combine the rest of the ingredients in a blender and blend until smooth. Pour the custard over the pears. Bake for 35-45 minutes until the center isn't jiggly and the pie is golden brown. Cool completely and then chill in the fridge for a few hours before serving. Ever considered to make it with chayote squash cooked in its juice, sweetener, and pear extract. They look exactly like pears and would drop the carbs a lot. 9 net carbs is kind of pricey. I have not. If you try lmk how it turns out! I have used berries before. Can i use coconut flour instead or almond? I have an allergy to almonds. Thanks!! Yes, use 2 tablespoons. It just helps thicken the batter. Hello! I bought 20# of pears straight from Oregon. I'm not into canning and I don't want anything too sweet. 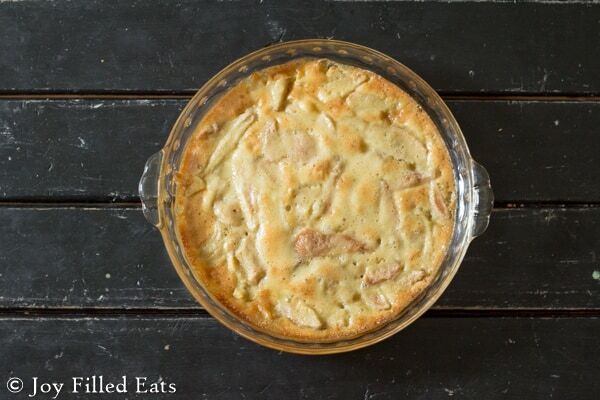 This pear vanilla custard pie looks amazing. I'm wondering if you think I could use honey or coconut sugar as a substitute for the sweetener? I appreciate your response! I'd use coconut sugar. You may want to increase the amount of sweetener a bit because what I use is twice as sweet as regular sugar. Honey might make the filling too liquidy to set. Thanks, Taryn! I appreciate the reply. Excited to make this! I used about 1/8 cup of coconut sugar, 1/8 stevia and less than 1/4 xylitol ( that was the closest I could come to her blend) and it turned out FANTASTIC! The coconut sugar adds more carb though. Hi can I add coconut oil or more butter and eggs to fulfill the keto percentage of fats to carbs? Will this slide to stay in ketosis? Thank you in advance. You could use berries instead of pears to reduce the carbs. I'm not sure if adding additional oil would work. Adding an extra egg and serving with whipped cream could increase the fat. Can it be frozen, please? I do not think this would freeze well.